Remember when I made the first tablet cover for Mr. Aitch’s e-tablet? It was too wide and too short. I finally finished it this afternoon. It seemed like this took F.O.R.E.V.E.R. since I already made one. It took awhile to get motivated to start it all over again. 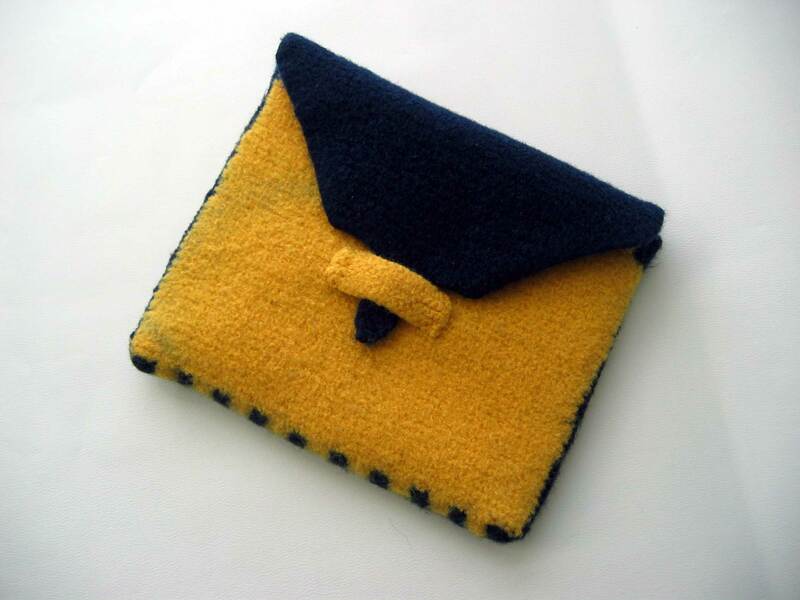 The pre-felting size was 11 inches wide by 23 inches tall. I had already sewn one side when I remembered to take that picture so just imagine that it’s really 23 inches tall. The all important pocket was 11 inches by 10 1/2 inches once it was all sewn together. I added a solid blue edge and checkerboard row to the top of the pocket area as well as knitted it longer. The back is solid navy blue and I didn’t take a picture of it since it was boring. I soaked it for about an hour in a vinegar and water solution before felting so set the blue dye so it wouldn’t run into the gold. I didn’t add enough vinegar this time since it did run a little. 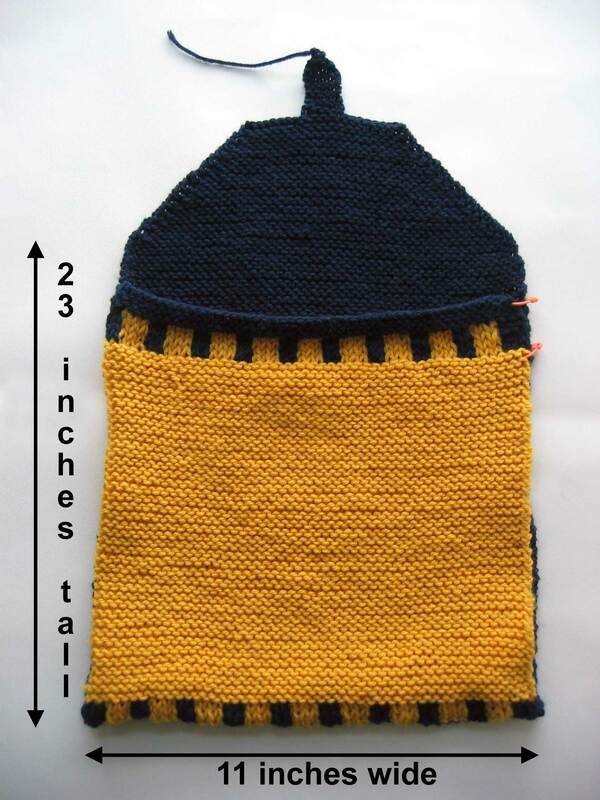 Post-felting measurements were 10 inches wide by 8 inches high for the pocket. That was the most important measurement. The lining was hand sewn using some microfiber suede cloth I got on sale at Joann Fabrics. Blood, sweat and tears went into this. Blood: when I stuck my finger with the needle while sewing the lining. Tears: when the first cover didn’t fit. Sweat: while felting this and wondering if it would fit. This entry was posted in knitting and tagged felting, finished object, knitting by Patti_is_knittinginflashes. Bookmark the permalink. Very nice. Did you order your tablet/notebook yet? You deserve one for Valentine’s day!!!!!! That looks gorgeous! I love the colors. So glad this one fits. I was really feeling for you on that first one. I think I would charge too much. Mr. Aitch is a lucky man! It’s fabulous! 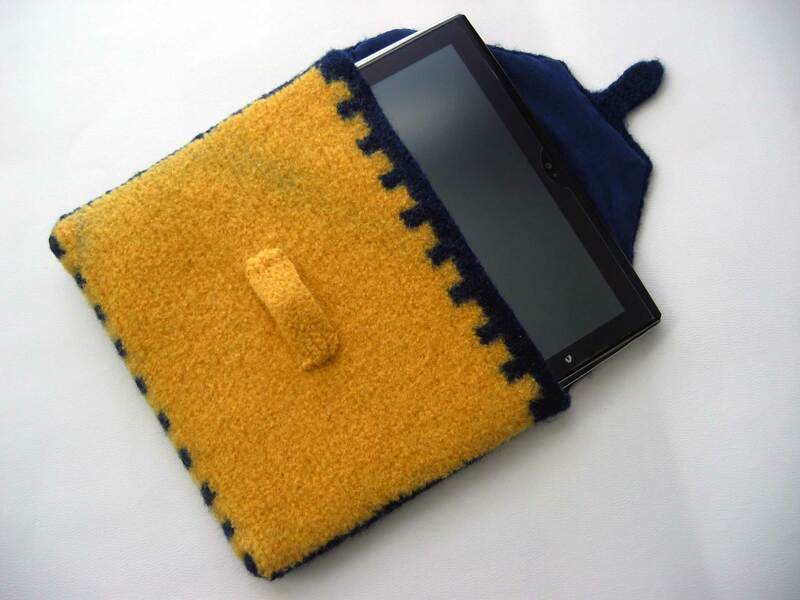 I hope you’ll be making something wonderful for your own iPad which I’m sure you do deserve!